Code Red is a manufacturer of high end radio accessories including hands free headsets for tactical use. Today, we're looking at their CQB headset, a lightweight, low profile rig designed for tactical use, and priced just right for the airsoft market. Compatible with a wide range of radios, you should easily be able to find a CQB headset to work with your radio rig. Keep reading for more info on this headset from Code Red! I met with Code Red at the Airsplat Customer Appreciation event, and was able to check out a few of their headsets. I fell in love with the CQB headset, and a short while later, I have one on my review desk! The headset is available HERE, with this model being the Midland/Maxon 2 plug setup. Different plug setups are available for Kenwood, Baofeng/Puxing, Motorola 2-pin, and Motorola FRS units, so odds are, there's a headset for you. They're all priced at $69.00. The headset was shipped to me via USPS Priority which got it to me in 2 days from Code Red, and it was very well packaged to prevent damage during shipping. The CQB headset is an extremely lightweight and easy to use headset for tactical use. It utilizes a single ear piece with flexible boom mic, attached to a wraparound lightweight frame that fits under most helmets and other headgear. It features an inline PTT (Push-To-Talk) button with a metal swivel clip for easy placement on your gear. The frame is easily adjustable for different sized users using a simple rubber strap system. The headset doesn't have a lot of frills, but really, it doesn't need them. It's designed to act a a simple, lightweight headset and it does that job astoundingly well. Code Red did a good job designing their packaging, as it really shows off the headset in a professional manner. There are a few details about the headset including compatibility, construction, as well as info on other Code Red products. There aren't any included accessories, however, the headset does come with everything you need to run it with your radio. Since the PTT is an inline system, there's no need to purchase a separate unit, keeping overall costs down. Otherwise, all you need is a radio to plug this into and you're ready to roll! The headset is comprised of a few main components, the ear piece, the boom mic, the metal frame, the PTT, and the wiring. I'll be going over each piece in detail in this section. The ear piece is made of hard plastic with a high density foam pad where it rests on your ear. There is a Code Red sticker located on the side of the ear piece, showing off that you're using high quality equipment. I'll talk about the sound quality in the next section! The microphone is mounted on a flexible boom which is very easy to adjust to fit your preferred mic position. The mic itself has a plastic housing and comes with a removable wind guard to cut down on over-the-air noise. Internally, the microphone is a noise canceling design, further cutting down on com noise. The frame is made of lightweight metal which is rubber coated with foam loops to rest on your ears. The frame is a wraparound design which fits behind your head, making it very easy to use with helmets, hats, or other headgear. A rubber strap is fitted on the metal frame, allowing you to adjust how tight the frame is held on your head for comfort and security. You want it tight enough that it won't fall off, but you don't want it too tight where it is getting uncomfortable. You can also bend and adjust the ear loops as needed to fit your specific head shape and to keep it from popping off your head. The PTT unit is made of plastic with a rubber button and is fitted inline between the headset and the plug. On the back of the PTT, you'll find a metal clip that swivels for easy placement on your gear. The button is large enough that it is easy to manipulate even when wearing gloves, however, it's not one of the massive buttons that some operators use. I haven't noticed any issues with the PTT size, it's just right for me. Lastly, the cables are well made with Kevlar reinforcement to keep them from fraying or breaking over time. It's a straight cable design, no coiling here, making it easy to tuck it in and around your gear as needed. The length from the headset to the PTT is 15”, and a further 32” from the PTT to the plug. The plug is a high quality design and as mentioned before, is available in a few different configurations. The overall build quality is great! This headset is designed for professional use and it really shows in its construction. Since it's so lightweight, you can wear this thing all day without any real worries. Plug the headset into your radio, and within a few seconds, you should be ready to roll. There aren't any crazy features for you to worry about programming. This headset is a fairly no-frills design, but it just plain works. The sound quality is great, no annoying pops or volume spikes to worry about. The PTT is responsive and works every time. No complaints from the other end of the radio either, with sound quality from the boom mike coming in clear. Honestly, this thing promises to be a lightweight, compact, headwear compatible headset, and it does just that. If you're in the market for a lightweight, simple to use headset, the Code Red CQB model is a fantastic option. It disappears on your head, weighing practically nothing and working well with most helmets, hats, or other headwear. 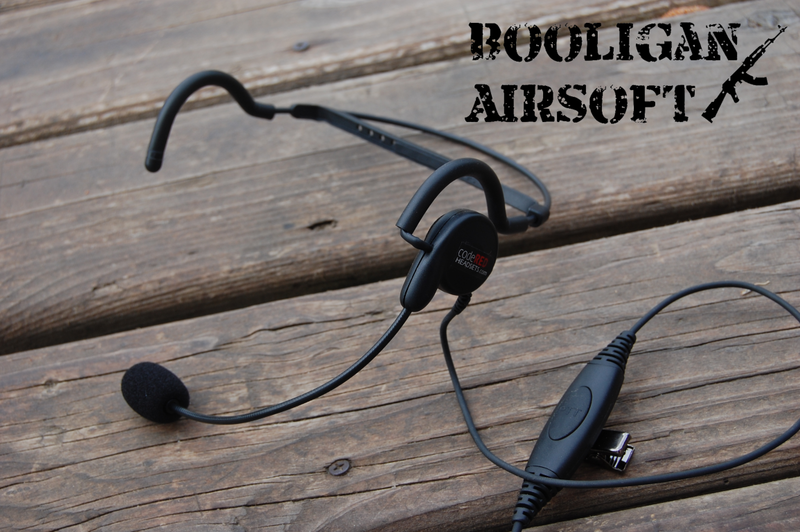 This headset is becoming more and more popular with airsoft players and field owners due to its durable construction and “idiot-proof” operation. Don't go into this headset expecting it to give you a head rub and shine your teeth as you use it, it's a very simple headset that just plain works. Many thanks again to Code Red Headsets, and of course, Airsoft Retreat!